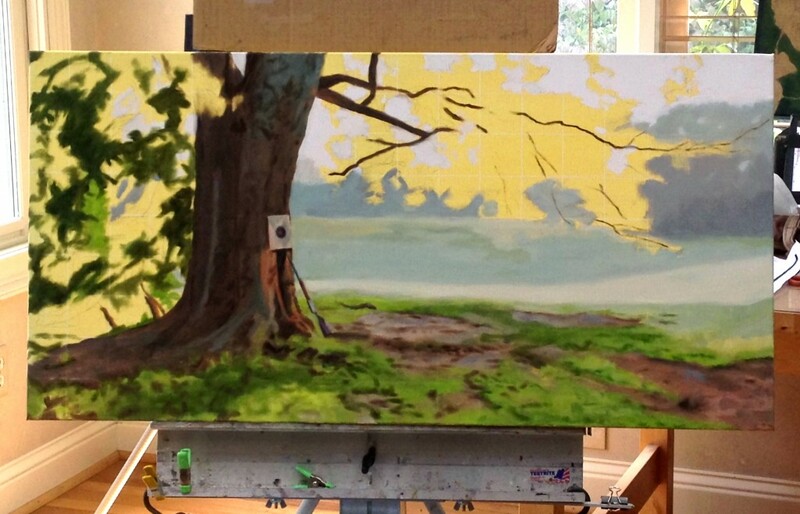 Back to Target Practice, adding more leaves and some textures to the lichen on the trunk. A last minute sale of the Brace of Doves at the Swan Coach House Gallery show that closed last week that brought the number sold to four out of six pieces. Picked up 8-Ball for the SCAA juried show and talked to my reps at Mason Murer. There’s a show in March that I’ll put the typewriters in. There’s another show that opens May 9th – the gallery’s 10th anniversary. I’m going to aim to have the four main paintings in the Catch & Release series finished. it seems forever away, but I know the 40×40″ is going to take slightly longer than eternity. I won’t actually be painting in April while I’m in Paris and Amsterdam, but everything will have a full month to dry. I’ll be able to varnish when I get back. Easy Peasy. Where have I been? First the trip to Boston – fab! – then Thanksgiving hit me like the lead engine pulling the holiday freight train. My series updates: I tried four different backgrounds on Recoil. I think this is the one that will stick. It’s four different shades of blue that lighten as they rise from the base to the top. 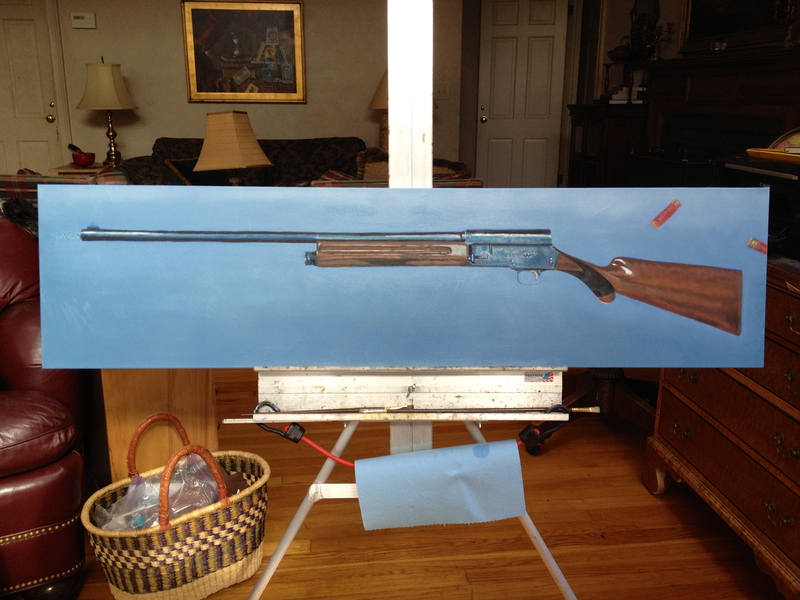 I’ll be sharpening up the shotgun and shells once the blue is fully dry. 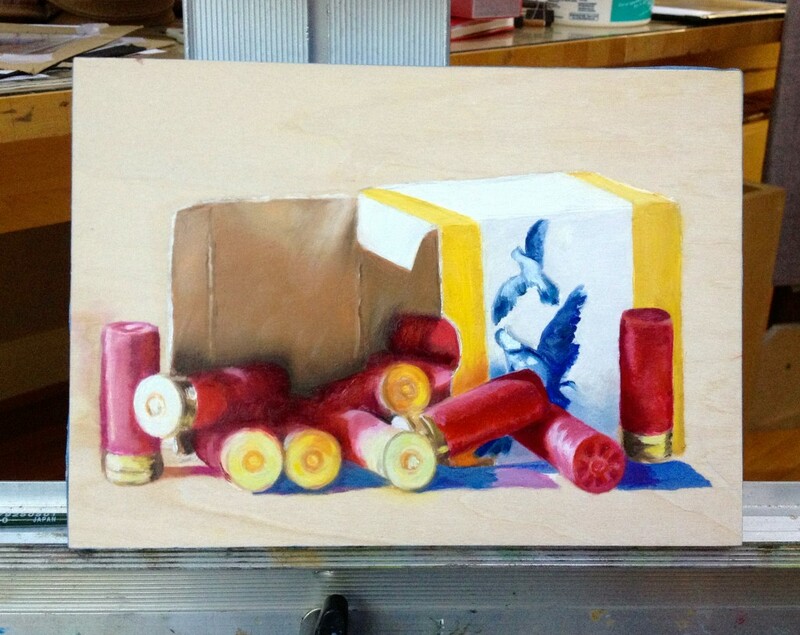 Today I spent from dawn to 5, laying in the beginnings of the birds, gun and knife. I only intended to work for four hours or so, but momentum took over. I fell into the zone of no time, no thoughts, all hand-eye. Just finished cleaning the brushes. Pleased with the feeling of progress. I went for large areas of color and value, resisting the desire to start placing the details of each feather. Hours of obsessive fun await. 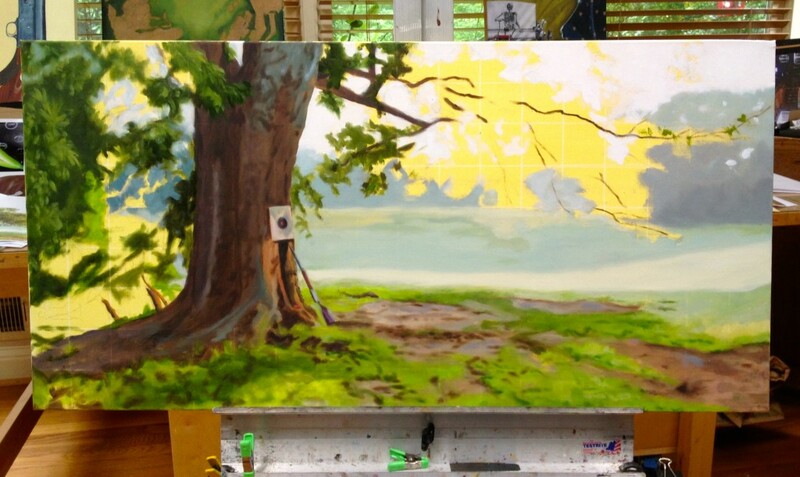 It feels great to have three of the five proposed canvases underway. 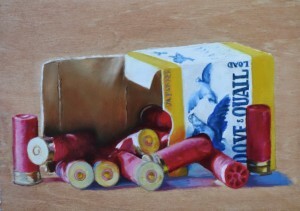 Finally, another painting on the Swan Coach House Gallery show sold, Sixteen Gauge. Woot! I’ve been AWOL from the blog, but not idle. I’ve been finding locations, building still lifes, doing photography, toning, gridding, and drawing two large canvases for the Catch & Release series. The drawings, though large and intricate, don’t really show up on a photograph, so it will be a while before they make a bow here. Meanwhile, almost imperceptible progress has been made on Target Practice. The most visible change is to Sweet Sixteen, which got the first layer of a sky blue background yesterday. 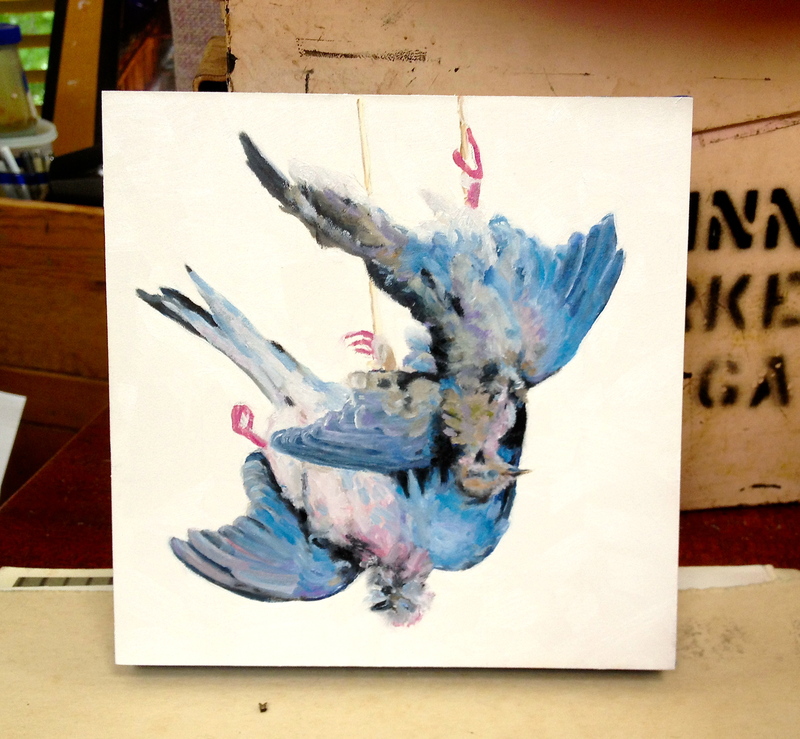 Instant gratification – doing six small paintings for the Swan House Gallery show. 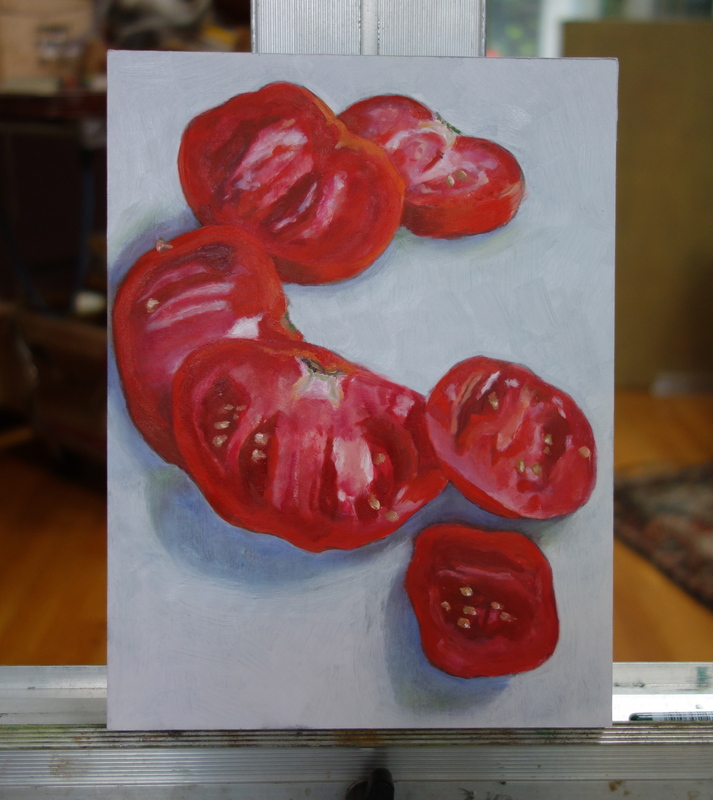 The opening last week was the usual eager crush, and my little tomato painting sold as soon as the doors opened, always a mood brightener. Best of all, I’ve booked an impromptu six day trip to Boston to saturate myself in the Sargent watercolors exhibit at the MFA and visit the legendary Isabella Stewart Garner museum. I’ve created a Boston folder for my itinerary, and searched out appropriate books and art-related apps on the redoubtable Sargent and Mrs Gardner. 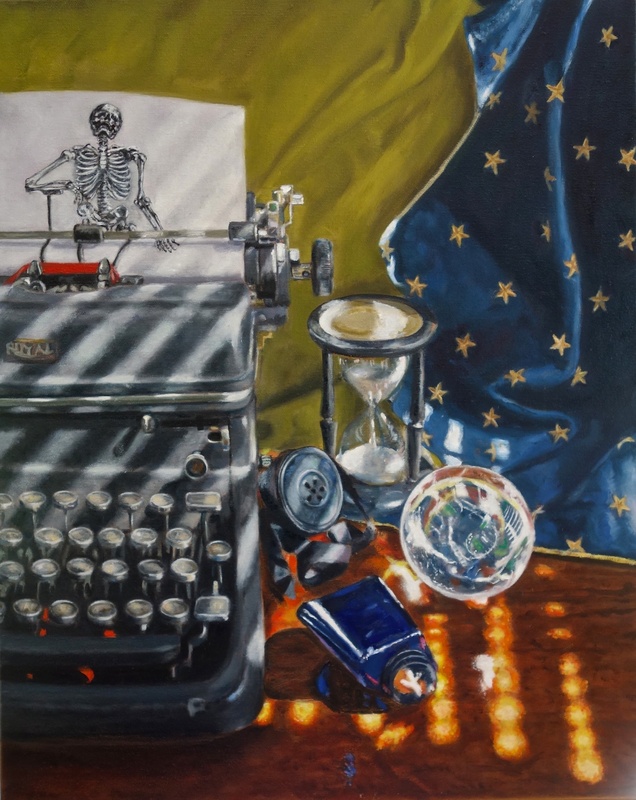 I finished QWERTY today and am a lick and a promise away from finishing Bones. 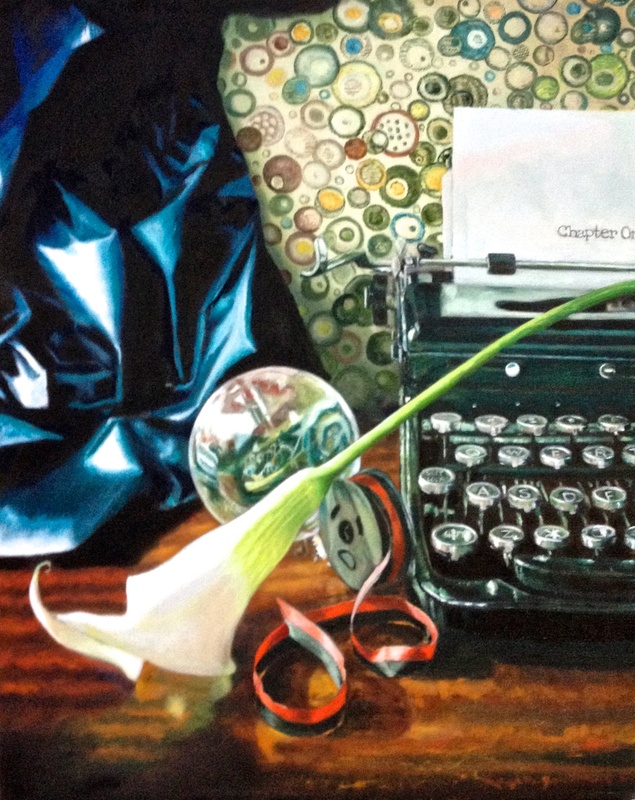 Most of the paint went on the individual keys, and the green on the arc of the lily stem.The only change was my decision to paint Chapter One on the paper, in as close as I could get to American Typewriter font. I spent most of my effort on painting the skeleton, which is almost disturbingly 3D now, but I like that. I focused the rest of the day on the detail in the crystal ball, and the light on the typewriter ribbon. It just needs a little phthalo blue scumbled around the lights in the drape and on the edge of the ink bottle, and a bit of sharpening on the Royal brand logo, and I’ll put a fork in it. it’s all over but the varnishing, when the dull darks will come back to life. I’ll do that Saturday, if the weather remains dry. It will be a varnishing binge, since I have the six little works and these two typewriters to do. Four of the small painting are done, two sets of thematic twins. The photos were taken at the end of the day, making them slightly blue and dim. First set are elements of hunting, which I was familiar with from childhood. My father and uncles were hunters. We ate dove and quail, and venison was traded for country ham. These shotgun shells were for my father’s 1958 Browning Sweet Sixteen shotgun. I’ve left the wood panel visible behind the image. 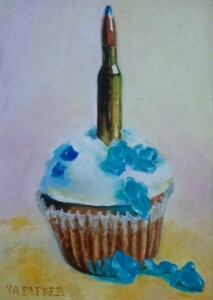 Next, a pair of cupcakes. My comment on the addictive nature of sugar. Using a 30-06 bullet for the candle tells you what I think of crystal meth. Two more to go, one of a sliced tomato and another cupcake. Varnishing will work its magic and I think I’ll stain the wooded edges the color of dark honey. 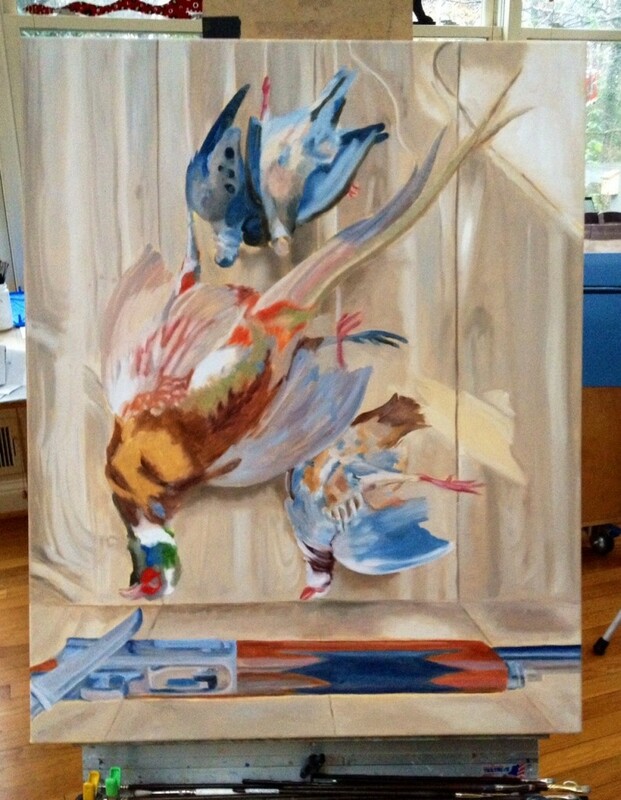 Today I did the final round on Doves, including the background. I might add a highlight here and or there, but it’s what I was going for. Afterwards I had an hour of energy left, so I worked on the sky and place more leaf/masses of green on Target Practice. Now for a left turn. 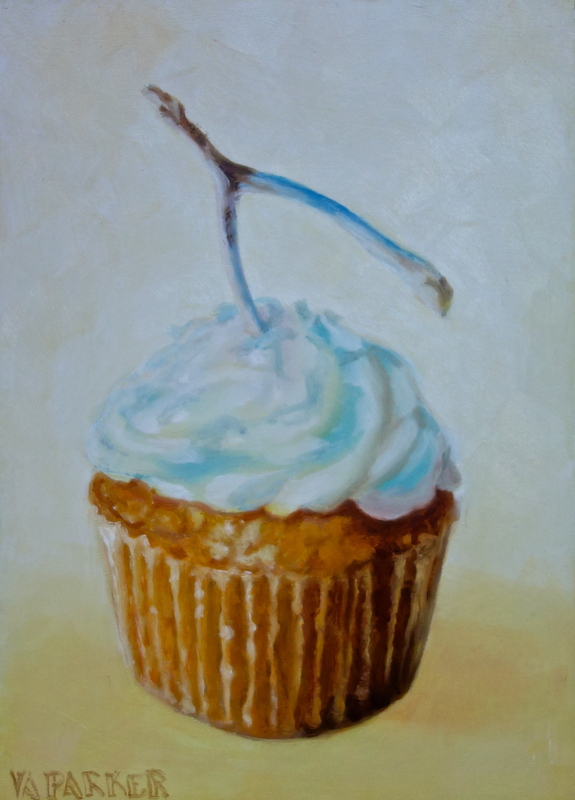 I am unhappy with the calla lily, though I will soldier on to the bitter end, so I’ve decided to paint a cupcake. The only thing left to decide is what I’m going to substitute for the ubiquitous candle. My candidates are a hollow point bullet, a wishbone, lit fuse, knife, and an artist’s brush. Thanks to invaluable suggestions from Ruth and Robin. I’ve got the wishbone (we are subsequently eating rotisserie chicken for dinner) and can probably pick up a single bullet from the gun range. The other idea I have is to balance a mini-cupcake on top of the hourglass I use in so many of my paintings. I auditioned cupcakes this afternoon and brought home a coconut, carrot cake, and red velvet. What they have in common is a variation on white frosting, which I wanted. I can make it as cute as I want to, given the switch out with the candle. 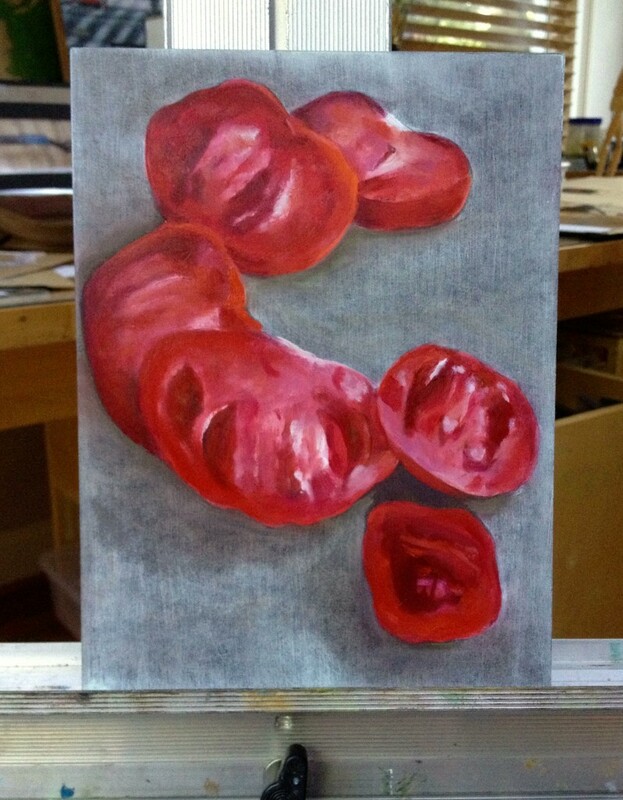 Did the tomato background. Wanted to go light, so I used a little violet, sap and thalo blue in the shadows color. It’s going to take at least one more layer. Did another round on the tomatoes themselves. Maybe two more to go, one that will be all highlights. Did a second round on the calla lily. I want more of a value contrast between the lily and and the background. I’ll get more layers on the petals before I give up and paint the background. Or maybe a stain? Lovely painting day. Pushed along on Target Practice. 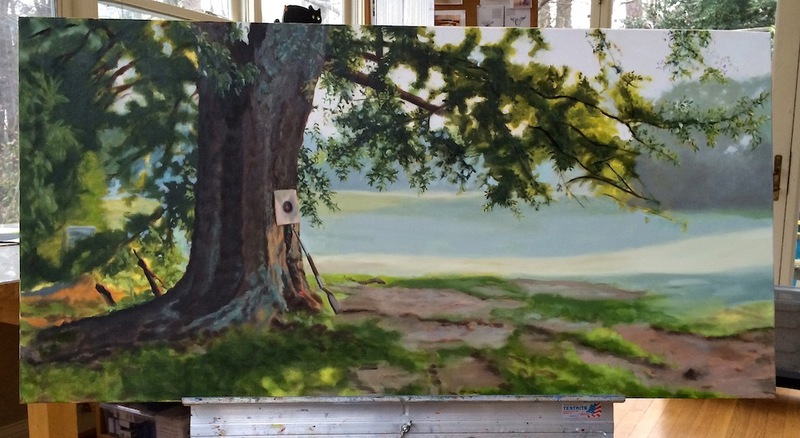 Added sky, areas of dark leaf shapes, boughs, a bit of bark delineation, much reworking of the grassy field foreground and background adding more texture. Selected a dozen candidates for the Swan Coach House small works show, then sifted through them to edit them down to the four requested. Sized them to print sight-size (same size as the final work – 5×7″) on my color printer. Doing two variations on a vintage box of shotgun shells spilling open, one typewriter ribbon and box, and one calla lily. I bought unprimed basswood panels to try out. What I’m going to do is float the central image on the unpainted basswood – no background. To to that properly, I’ll do a drawing in white chalk of the image, then carefully paint inside the lines with two coats of gesso. 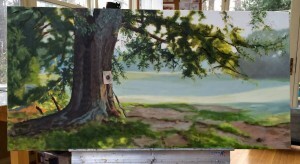 I’ll do the loose (for me) oil sketches on the gesso. I like the idea of the natural wood against the jewel-like artifice of the oil paint. And the challenge of keeping the virgin wood pristine while painting. Perhaps I’ll mask some of the wood with blue painters tape while I work. 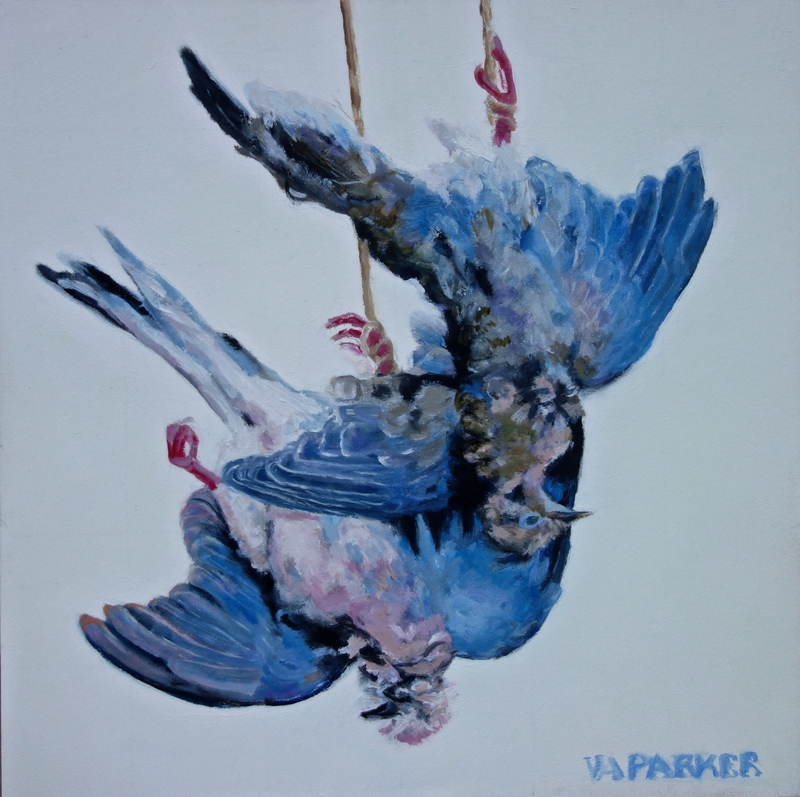 If I am feeling bold, I’d throw in a brace of hanging doves. 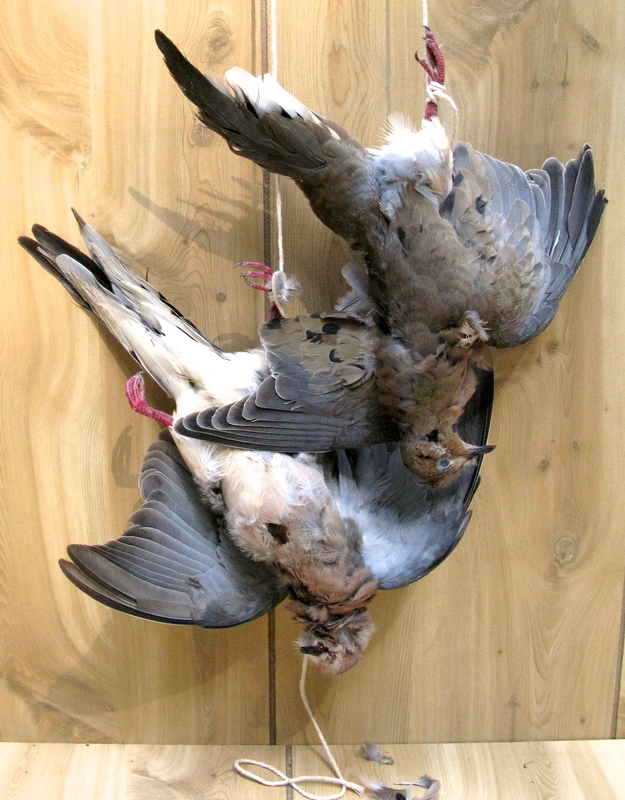 I spent yesterday afternoon photographing three doves donated by my hunter neighbor. 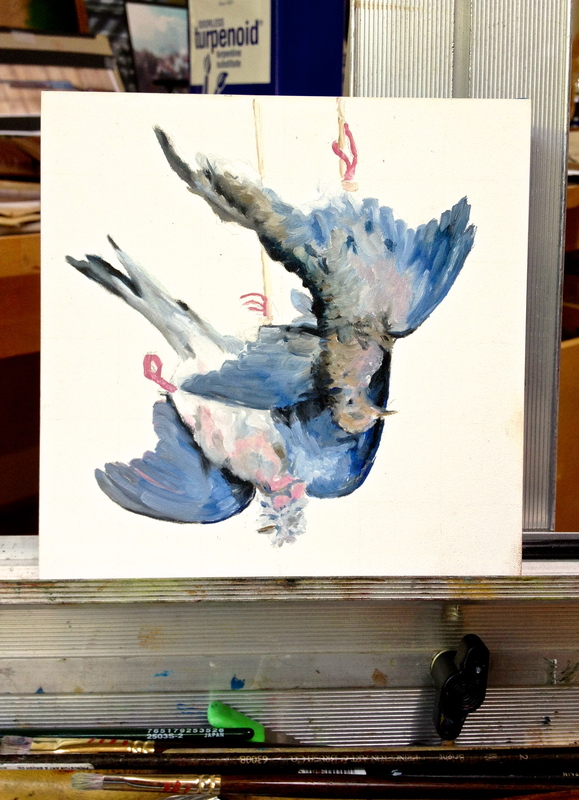 I tried various combinations of birds, hanging them upside down in the classic game painting pose. Sometimes the light was hot and yellow, with lots of shadow. Here’s one photograph that’s got a mostly even, cool, bluish light. It won’t be dry enough to take to the gallery tomorrow, but maybe by Thursday. Daughter gave me a ride to Binders to find frames, then we took turns throwing a ball to Maddy the dauntless tri-color. 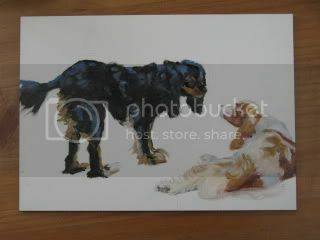 I have begun thinking of these as little oil sketches. I love what their body language expresses, more than the hair-perfect portraits.